This year, you will be treated to something entirely different, and from the looks of it, even more exciting. 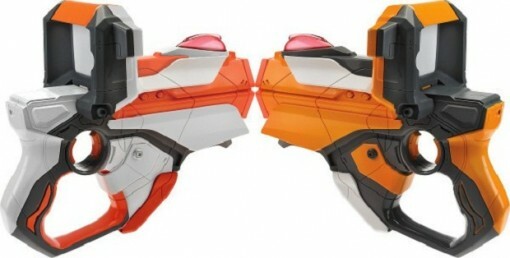 Hasbro has announced new Lazer Tag guns which are compatible with the iPhone and the iPod Touch. These Lazer Tag guns combine the “power, precision and excitement of live-action blaster battles with the high-action, strategic, augmented reality gameplay of traditional video games”. Can it get much better than that? The new guns have a slot that will securely hold your iOS device. You will need to download an app to have the entire experience. The app allows you to monitor your gear and power levels, as well as connect to up to 23 other players for an intense game. In addition to these, the heads up display included in the Lazer Tag guns also gives the player a view of the augmented reality targets and enemies. The Lazer Tag guns have a virtual firing range of more than 250 feet. If you do not have anyone to play with, you may opt for the single player mode. The products will be available on the first of August. For the Lazer Tag Blaster, expect to pay $39.99. For the set, the price is $69.99. The app for the iPhone and/or iPod Touch is free.